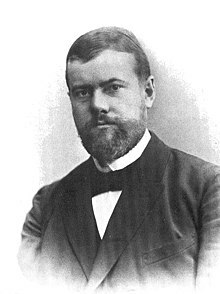 Karl Emil Maximilian "Max" Weber (German: [ˈmaks ˈveːbɐ]; 21 Aprile 1864 – 14 Juin 1920) wis a German sociologist, filosofer, jurist, an poleetical economist whase ideas profoondly influenced social theory an social resairch. Weber is eften citit, wi Émile Durkheim an Karl Marx, as amang the three foonders o sociology. Weber wis a key proponent o methodological antipositivism, arguin for the study o social action throu interpretive (rather nor purely empiricist) means, based on unnerstaundin the purpose an meanin that indiveeduals attach tae thair ain actions. Unlik Durkheim, he did nae believe in monocausality an rather proponed that for ony ootcome thare can be multiple causes. ↑ "Deutsche Biographie" (in German). Retrieved 25 September 2014. ↑ Kim, Sung Ho (24 August 2007). "Max Weber". Encyclopaedia of Philosophy. Stanford. Retrieved 17 February 2010. ↑ Max Weber; Hans Heinrich Gerth; Bryan S. Turner (7 March 1991). From Max Weber: essays in sociology. Psychology Press. p. 1. ISBN 978-0-415-06056-1. Retrieved 22 March 2011. ↑ Auguste Comte, Marx and Weber: Benton, Ted (1977). Philosophical Foundations of the Three Sociologies. London: Routledge & Kegan Paul. ISBN 0-71008593-1. ↑ Tiryakian, Edward A. (2009). For Durkheim: Essays in Historical and Cultural Sociology. Routledge. p. 321. ISBN 0-75467155-0. This page wis last eeditit on 24 Mairch 2017, at 16:27.